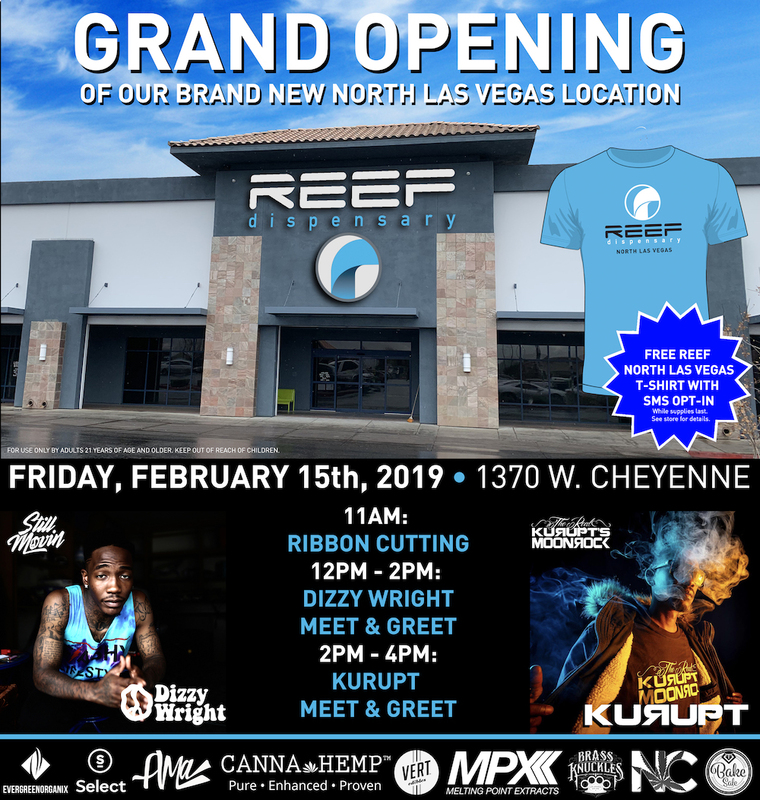 LAS VEGAS, NV – Reef Dispensary is proud to announce the grand opening of its all new, expanded North Las Vegas location, positioned in the same shopping center as the original NLV dispensary. The new 7500 sq. ft. location is over three times the size of the previous location, taking over what was formerly a supermarket, and will be housed at 1370 W. Cheyenne. The massive space is equipped with twenty budtender stations to serve the upwards of 2000 customers that visit the dispensary per day, with room for expansion. The giant-sized North Las Vegas cannabis shop will be Reef’s largest dispensary storefront, among the six that it operates across Nevada and Arizona. Reef will celebrate the grand opening of the new 24-hour location on Friday, February 15th, 2019, with an 11AM ribbon cutting ceremony. The event will feature special guest appearances from rappers Dizzy Wright (12pm-2pm) and Kurupt (2pm-4pm), as well as vendor pop-ups from local cannabis brands, including Evergreen Organix, Select, AMA, CannaHemp, Vert, MPX, Brass Knuckles, Nature’s Chemistry, and Bake Sale, as well as one from popular streetwear shop Still Movin’. Additionally, limited edition Reef Dispensary North Las Vegas t-shirts will be given away all day long at the event through a special SMS opt-in offer. Reef invites you to join us for the christening of its new North Las Vegas location on Feb. 15th, 2019, beginning at 11AM. Reef Dispensary’s 165,000-square-foot indoor cultivation facility, as seen on Vice news, is the largest of its kind in the state. Reef’s Las Vegas base of operations uniquely houses each the cultivation, production, and sale of its products under one roof. Reef Dispensary offers service for recreational customers and medical marijuana patients at six locations across Nevada and Arizona, with an unprecedented level of concierge customer service and a wide selection of products for every palette. Tryke Companies is a network of ten MMJ licenses for the cultivation, production and retail sale of medical cannabis in Arizona and Nevada. Tryke retail operations, d.b.a. Reef Dispensaries, has existing dispensaries in Nevada (Las Vegas, North Las Vegas, Sparks, Sun Valley) and Arizona (Central Phoenix, Queen Creek), with additional locations coming soon.